I was a nerd in high school. Not one of those faux nerds who wears black, adores Daria and secretly designs rockets and makes downscale models of them work, not one of those nerds a-la Molly Ringwald who is shy and designs super-amazing clothes out of thrift store rags in her spare time, not one of those nerds who is really the League of Legends champion and the toast of Korea in secret – I mean a REAL nerd: the overweight, frumpy teen, too boy obsessed to look past Richard Pattinson, too lacking in imagination to appreciate why Robbie Williams had to leave Take That, and too conservative to realise that MTV is a model of rampant conformity. In short – I was like all teenagers, from every generation, living a rather quiet life defined by the balance between doing the opposite of what my parents expect of me posited against my sublimated but desperate fear of having to leave them and enter the big wide world alone. It wasn’t until years later that I realised there was an entire “teen thing” going on out there that I wasn’t a part of: Some teens were potent, self-reliant beings chasing political activism, making a real splash for themselves, some teens were wild rebels, chasing new and exciting forms of music that were decades ahead of their time and some teens were failing class because they were irrepressibly staying up all night inventing what would in the future become a mobile phone widget that would make them millions overnight. Then it wasn’t until years after that, that I realised almost no teenager is any of those cool things, and in fact people have a propensity to glamorize their teen years, and pretend they got off to a “cool” start while they’re gabbing at their guests over their red wine at dinner, mostly because they met these people in the car pool at the local school and the “dagginess” of domestic bliss is a tidal wave that has to be stopped. It is also common to imagine we could have done something other than obsess about parental control, secretly lust after the popular kid in dreams given more value than reality, or spend hours in our room with music in our ears gazing into nothingness, when the truth is, even the most dangerous, desperate and glamorous teen is nervously following an intangible other, is terrified of what others think of them and is dealing with issues of immense insecurity in their own, predictable way. Teens are not – ever under any circumstances – aggressively pursuing something. They are always reactionary. The evidence for this lies all around us, mercurial only in that its identifiers change with each generation. You used to be able to recognise teen conformity by music, then films and television shows, then gadgetry, and then on-line behaviour. Ask the collectors of big data if teens are impossible to pin down because of their wild independence, or one of the most easy groups to predict, and I suggest the answer lies in how simple they are to market to as a group. And all this brings me to the film Footloose, a classic example of teen acceptance and conformity shrouded in rebellion if ever there was an example of it. Footloose is the kind of film that I will contend far better represents true teen age years than all the Ferris Beullers Days Off, and Heather’s can muster in their cool grasp. Footloose is poorly made, injects a plot hole rather than round out a character, provides conflict for no discernible reason only to remove it when its warranted, and is based on an imaginary premise so ludicrous it coud never actually happen. In short, Footloose is the way teenagers really see their lives, a certain kind of narrative that is separate from all the evidence to the contrary. As a female, I can tell you, the scene in the church where Ariel Moore (Lori Singer in a role Madonna auditioned for) screams at her father revealing a lost virginity (which the film never makes clear so you can impose your own truth there) a declaration that results in no response from him except to go outside and prevent the banning of books, is a teen girls fantasy come true, as if the very act of losing her virginity is so powerful it converts her uptight father to see the error of his ways. 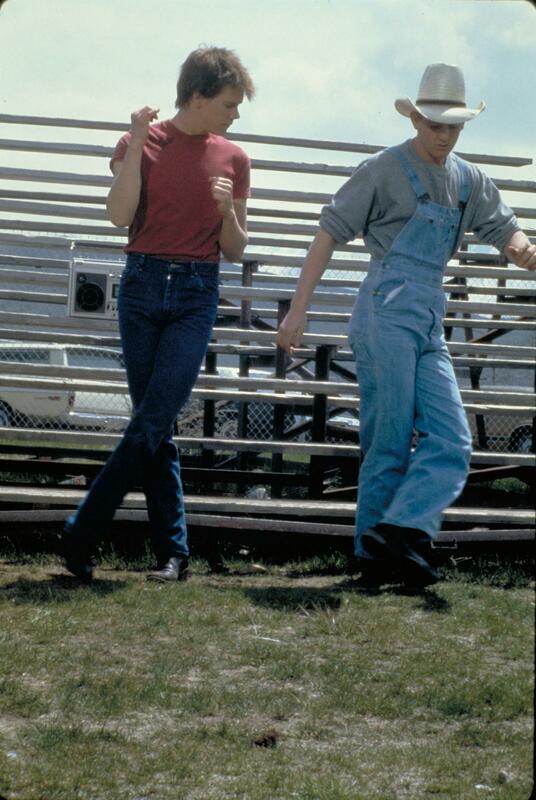 Footloose is the truth of teen rebellion; unlikely, irrational, conformist, and accidental. While films like Kids might shock the world with their realistic depiction of the irresponsible attitudes of teens in their attempts to pursue identity, it is the Footloose’s of the world that give you the insight into how the teens are thinking. What is unrealistic about Kids is Jennie (Chloe Sevigny) character who spends a day pursuing Telly with a maturity far beyond her years. You find no such attention to maturity in Footloose, a film so immersed in the fantastic sheen of teen rebellion that every teenager has wisdom far beyond the adults, something most teens suspect in their hearts if they don’t scream it at the top of their lungs. It is the adults who have to learn lessons in Footloose, and the teens who will teach them. Footloose uses the issues Kids raises (remember the town has banned dancing because teens under the effects of substance abuse have died in a terrible car crash) but openly ignores them in favour of cool MTV inspired dance moves. Footloose astounded critics, who hated the film, by becoming an enormous box office success. The two primary roles were heavily contested by teen idols of the day, the people who really knew the fame and success the cheesy film would bring. It wasn’t just a huge favourite with teens, it has become a cult classic, still watched and loved by generations the world over. Is Footloose a great film? Maybe not, but it does do one thing extremely well; it taps into the true, embarrassingly unsophisticated soul and heart of teen rebellion.